Angela Merkel comfortably won election to a fourth term as chancellor of Germany on Sunday, but the far-right Alternative for Germany party gained enough share of the vote for a toehold in parliament. Merkel’s Christian Democratic Union won about 32.5 percent of the vote, leaving it in position to form a governing coalition. Its central rival, the center-left Social Democratic Party, received about 20 percent, its worst showing since World War II. Merkel’s party’s standing also dropped substantially since the last election in 2013, when it won 41.5 percent. Merkel now faces the difficult task of forming an awkward alliance with two of the other parties that hit the 5 percent threshold needed to gain representation in parliament, likely the business friendly Free Democrats and left-wing Greens. After governing with Merkel for four years, the Social Democrats have said they will not join her coalition this time around. Merkel is Europe’s longest-serving head of state and the third chancellor in modern German history to win four elections. But the big story of the day, beyond her victory, was that Alternative for Germany, a four-year-old nativist friendly party, garnered 13.5 percent of the vote, more than predicted in polls. It’s the first far-right party to reach the 5 percent threshold since the end of Nazi Germany. The country has been understandably resistant to populist political parties since the disastrous rule of Adolf Hitler. But Merkel’s decision to open up Germany to over a million Syrian refugees in 2015 left her vulnerable to a challenge from the right. Alternative for Germany, whose platform first centered around opposition to the euro currency, developed into a virulently anti-immigrant and anti-Muslim party, bringing into the mainstream subjects that had previously been taboo in the country. It is also overtly hostile to the European Union. “We will go after them. We will claim back our country,” Alexander Gauland, one of the party’s leaders, said after the election, echoing the tone of populists around Europe and in the U.S.
After the United Kingdom voted for Brexit and the U.S. elected President Trump in 2016, Merkel’s future as a centrist leader seemed particularly shaky. But over the last several months, she has stabilized her position throughout a surprisingly sleepy election — Russian hackers appeared to mostly sit it out — to the point that her victory was not in doubt heading into Sunday. 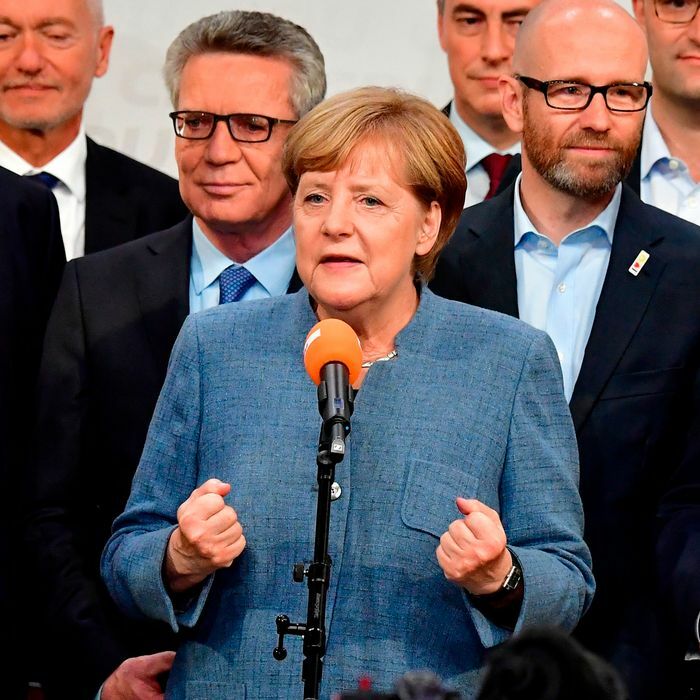 But she and the rest of Germany’s establishment were clearly rattled by Alternative for Germany’s rise, and in a speech after the results came in, Merkel vowed to win the disenchanted voters back. “We want to win back AfD voters by solving problems, by taking account of their concerns and fears, and above all with good policies,” she said.